The door is constructed out of thick and tough steel plates, and it is further reinforced with another steel plate which is drill and hammer resistant. The door tightly meshes to the body when closed. Operated by a pronged handle in front allowing fingers to fit in snugly and controlled by an eight lever dual control lock with evenly spaced shooting bolts to give a balanced pressure and safety from dislodgement. 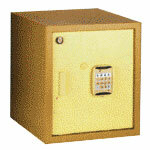 The safe is also protected by an automatic self-locking device, which gets activated if the lock is dislodged by explosives or comes under attack by other means. Which means that the door remains firmly shut and the valuables are safe. Weight (Approx): 13.5 Kg Volume (Approx): 18 ltr. Fire resistant (FR) 51.5Kg 30ltr. Standard Model : 32 Kg / 37 Kg* 69 ltr. Fire resistant (FR) :77 Kg / 83 Kg* 52 ltr.